1, compact structure, beautiful and delicate, save the operating room or laboratory space; host with mobile handle, portable and convenient. 2, user-friendly design, built-in knob operation, easy operation; host soft pad suitable for placing on any table, increasing the stability. 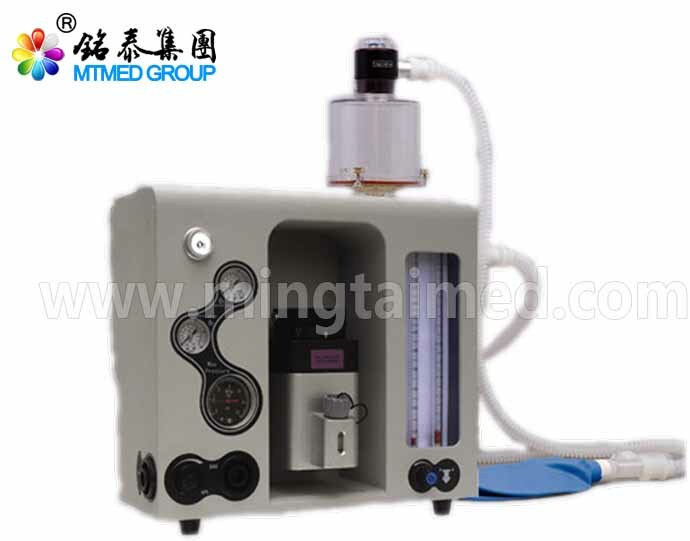 3, professional closed breathing circuit design, provide stable gas anesthesia, save anesthetic gas consumption, to ensure the cleanliness of the operating room and laboratory environment. 4. Oxygen and laughing gas double glass tube flowmeter, with a minimum scale of 100ml, precisely adjustable, suitable for low-flow anesthesia in small animals; ensuring rapid recovery of anesthetized animals. 5, with rapid oxygenation function to ensure the oxygen supply of anesthetized animals and clinical anesthesia needs. 6, professional inhalation and exhalation valve, to ensure that the anesthetized animal's respiratory status is normal. 7, with APL pressure relief valve, to prevent from air damage for anesthetized animal because of excessive pressure, to ensure the safety of anesthetized animals. Looking for ideal Veterinary Anesthesia Machine Manufacturer & supplier ? We have a wide selection at great prices to help you get creative. All the Anesthesia Machine for Pets are quality guaranteed. We are China Origin Factory of Pets Anesthesia Machine. If you have any question, please feel free to contact us.